Today my mother and I made a huge step forward in our scrapbooking process. We bought a Cricut! Oh, yes we did! It’s the Personal Electronic Cutter model (aka: the smallest one) and it was on sale at Joann’s. So we went halves-ies. It’s too much fun 🙂 We think there might be a danger of addiction happening here. Anyway, here’s a couple of things that I created, with no pattern and just playing around. Love them! In the picture of the cards, the one on the left (the graduation one, which was for my little sister. Way to graduate!) was cobbled together after the fact. We’d already amassed a pile of random cut out items, and I started piecing things together. It was cool to see something come together quickly when I hadn’t had any thing in mind when I started. The “Love” one was created after I decided I was done for the evening. As I was putting stuff away, I saw this design in some of the scraps. Of course, I had to get everything back out and make it. 🙂 It was worth it. I’m so looking forward to all the fun things we can do with this. Especially after we get more than one cartridge! Quick, fun, and super cute. I’m going to love this machine. The wonderful device that give us such fun times. The handles are alternating rows front post dc and back post dc. Again, it makes a wonderful texture and the handles won’t be stretching out at all. However, it’s basically doubling the fabric and therefore the time to finish it. It’s going to be so fantastic when it’s done though, it will be totally worth it. Another learning adventure on this project was around the side seams. Up until now, I’ve picked projects that didn’t have seams. Partially by chance, partially because I didn’t want to mess with learning it. Turns out, that was silly. Seaming was easy 🙂 I don’t think I did a real impressive job on it, but as I keep doing it I’ll learn better ways. What matters is it works, it’s solid and most importantly, it’s done! Well, the bag is out of the bag. Yep, my present to my mom is a bag and I’ve finally shown it to her. No, it’s not done, but she knows anyway. Since one of my main times to work on projects is on Sunday afternoons when I’m with my family, trying to keep it a secret from Mom any longer would have meant it taking absolutely forever to get it done. 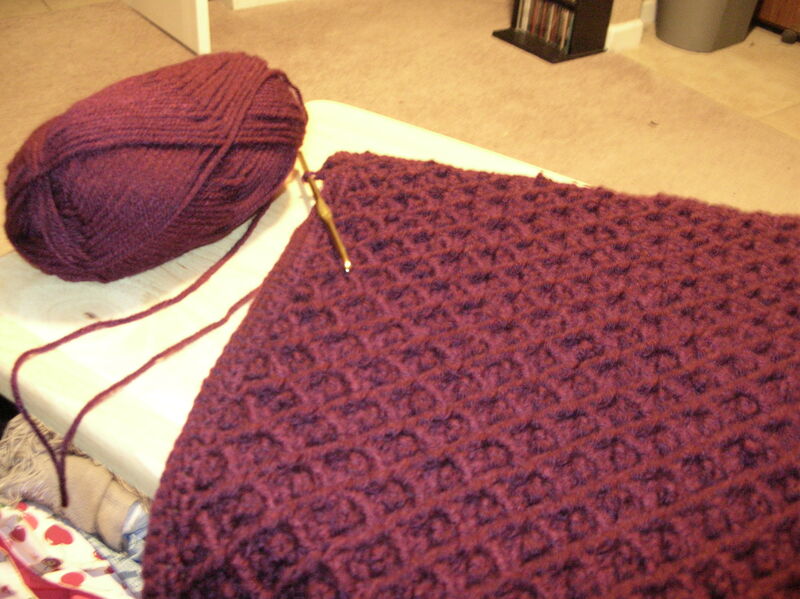 Anyway, the project is bag from a Crochet Dude pattern. Here’s a link to a picture of the pattern. (On a side note, he’s now one of my favorite designers. Love his stuff!) The only downside to this pattern is that it’s essentially a doubled fabric. I do a row and then do a row over it. Beautiful and wonderfully textured, but it’s another reason this bag is taking a while.